In some parts of the world air conditioning units are used constantly to make life more comfortable in hot conditions. Air is usually cooled in these units by passing the warm air over cold cooling coils – a process that works well to cool air. However warm air tends to hold a lot of moisture and that moisture is released if the air hits a cold surface, consequently air conditioning units generate a lot of water during operation. The water is sometimes drained off directly but in some cases the water drips into holding containers that are designed to be regularly emptied. In many cases the moisture appears in more than one area of the machine – the filters, the ducting taking cold air back into the room, the air directing fins and so on – anywhere there is moisture mould can grow. Moulds such as Aspergillus will grow very happily under these conditions – once it has water it can slowly grow on all the dust that also collects in air conditioning units. The result is that warm air is drawn into the air conditioning unit, over cooling coils that can be coated in fungal growth introducing spores and gases released by the fungi. Similarly if water is held in the drip pans for a few days moulds will happily grow and pollute the air significantly. People with ABPA (allergic broncho-pulmonary aspergillosis) and other health conditions that render them sensitive to moulds will rapidly react to breathing in such air and can become ill as a result. To prevent this, always ensure any air conditioning unit you use (including the one in your car) is regularly and thoroughly cleaned. In some cases responsibility for cleaning air conditioning units is not personal – at work or on holiday we rely on employers and managers to have robust regular cleaning routines. 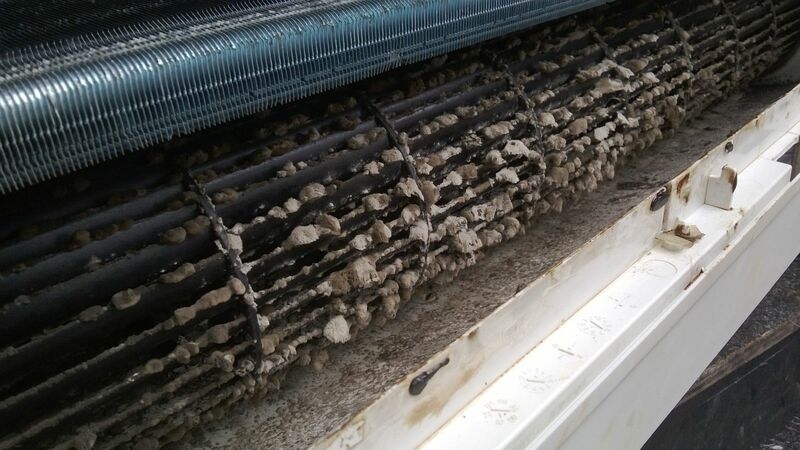 Sadly this is not always the case and the personal story copied below (originally published here in our HealthUnlocked group) tells of several cases where hotels in humid countries are not adequately cleaning their air cooling machinery. Most of their guests will not be affected, other than perhaps noticing the musty offensive smell that mouldy air conditioners tend to give off, and that makes it doubly difficult to get the management to believe that the problem exists, let alone take rapid action. I was first diagnosed with ABPA around 2001. I was living in the UK and had started working in a damp, unheated and basement office with no windows. I had mild asthma, but my coughing and wheeziness gradually got worse and worse until I finally went to a private hospital and got an ABPA diagnosis. Apart from prescribing itraconozole, my doctor obviously advised that I get out of the damp office. But he also said that if I wanted my life to be minimally-affected by ABPA, I should (if my finances permitted), emigrate to live in a hot and humid climate. So it was that I left the UK and settled to live on the Thai island of Phuket, close to the beach. The air was clean, the climate was hot and humid, and my ABPA all but disappeared into remission, with no need for taking any medicine. – I worked in Cambodia and my ABPA did NOT flare up. The climates were all very similar. The amount of road traffic pollution was about the same. Why was I OK in Cambodia, but not in the other locations. After a lot of thought about my lifestyle, I identified the problem! When I stayed at my home in Phuket, I stayed in a room with fan cooling, not an air-con unit. When in Myanmar and Laos, I stayed in hotel rooms with air-con. I ‘Googled’ Aspergillosis and air-conditioners, and found that dirty air-con filters are a major source of the fungal spores that cause/aggrevate ABPA. I was able to check the filters in my hotel room in Myanmar and indeed – the filters were filthy. I switched off the air-con for a few days and my ABPA symptoms reduced greatly! So, beware of dirty air-con units. Either use fan=cooling or make sure that the air con filters are cleaned every week.